I spent the first half of the year working in this restaurant to save money for my trip. Working long hours on London wages and living at home with no rent, I managed to save up enough to spend the next three months in South America and another two in Thailand and Australia. The year was unforgettable and – as with most of my memories – could easily be measured in experiences with food; from clearing tables and calling checks to drinking pisco sours and eating ceviche, discovering pad thai and tom yum, picking beetroot out of sandwiches (the downside of Australia . . .) and enjoying BBQs on the beach (. . . the definite up-side). Surprising then, that with all the unusual sights, sounds and smells on offer, one of my most enduring memories of food from our travels is that of the ice cream. Our slight obsession with the sweet, cold stuff began in Thailand. After fresh fruit shakes at breakfast, simple salads for lunch and plates of pad thai flecked with crunchy beansprouts, creamy egg and tiny dried shrimps for supper, we found ourselves on more than one occasion entering a Swensen’s Ice Cream parlour, inexplicably drawn by the tacky neon lights, banana splits, hot fudge bonanzas and sprinkles on everything. Maybe our bodies craved the sugar, maybe it’s because it was insanely hot and the ice cream parlour was practically the only place we could find with air conditioning (the rusty fan on the floor of our dingy hostel simply didn’t cut it) or maybe we were just plain greedy, but ice cream became an almost daily habit. Once we arrived in Australia, this habit developed into a fully blown addiction with the discovery of Cold Rock. Nowadays practically every shopping mall has its ice cream or milkshake equivalent – a tiny counter behind which sit a huge array of glass jars filled with chocolate, sweets, cakes and candy to ‘mix in’ to your favourite milk or ice cream base – but back then we’d never seen anything like it. Staff would slap your ice cream onto a cold stone slab, sprinkle over your treats of choice then smash and mash all the ingredients together into an amazing lumpy, bumpy usually entirely over-the-top concoction. The results were then squashed into a cup, speared with a tiny spoon and handed over with a sense of ceremony and a large pile of napkins to mop up the inevitable sticky state it would leave you in. This was very different to the ice cream I’d eaten before. Growing up we spent our family summers in Italy where gelato was smooth and clean, the only hint of an addition being a small sprinkle of nuts, a swirl of sauce or the scratchy scribbles of chocolate in stracciatella. Cold Rock ice cream was a confection of an entirely more vulgar persuasion – fit to bursting with chocolate and cookies, hunks of cake, sugar-shelled sweets and candied fruit – with the focus more on the contents than the quality of the custard or cream itself. Fast forward several years and I’m now the proud owner of my very own ice cream machine. While I still love the excitement of visiting an ice cream parlour and picking out flavours, I also absolutely love making my own. Depending on my mood I’ll mix it up – one week it could be the creamiest gianduja gelato, made with hazelnuts steeped in milk and strained to create as smooth a texture as possible, the next I might stir rhubarb into a custard base for the contrast of creamy ice cream and slightly chewy frozen fruit. Sometimes only sorbet will do, and others, it’s all about the mix-ins; deliciously sticky, sweet, and ever so slightly over-the-top. This ice cream falls into the latter category. A couple of months ago I made this treacle tart with rosemary sea salt. Anyone who’s been watching Heston Blumenthal’s latest TV show will be aware of his obsession with salting anything sweet to bring out the flavour, and the addition of herbs was a revelation, providing the perfect contrast to a dessert that can otherwise overstep the mark between sweet and slightly cloying. As I was eating a mouthful of pastry with a scoop of smooth, cold clotted cream ice cream, I wondered if the two could be combined in one treacle tart extravaganza. Originally I intended to infuse the cream with rosemary, stir some pastry through the custard and lump the whole thing into one. However, after surveying all my ingredients I realized I was moving towards Cold Rock overkill territory – the moment you realize that the eyes of your greedy inner fat person have definitely got a whole lot bigger than your stomach and you’ve simply tried to cram far too much into your poor unsuspecting ice cream base. One scoop can only hold so much. Common sense prevailed as I considered that one of the joys of a good treacle tart is the crispy, flaky crust under all that rich, oozing filling. So I baked my pastry blind as snappy little biscuits infused with chopped crystallized rosemary (made with a combination of sugar and sea salt), and kept my ice cream fairly simple with nuggets of treacle tart mix and studs of buttered pecan. I also attempted pastry ice cream cones, on which I had about a 50% success rate; some turned out beautifully whilst others flaked and fell apart as I attempted to remove the moulds. I’ve included some vague instructions on making the cones below as it’s something I’m still experimenting with, but if you want guaranteed success first time I’d bake the pastry as biscuits or in a mince pie tin and serve the ice cream separately. When making an ice cream with mix-ins, remember that speed is vital so that ice cream doesn’t melt and cause nasty ice crystals later. Big chunks of mixture can cause havoc with the motor of your machine so add them at the end, working quickly to layer the ice cream before putting straight into the freezer. This ice cream can be served straight away, but if you leave it for a couple of days the nuggets of treacle tart will go incredibly chewy with a slight softness round the edge as the ice cream seeps in. I was impatient and dug straight in, so only discovered this last night as we scraped a final meager scoop from the bottom of the tub. Time to make another batch, I think . . . Put 250ml of cream in a medium saucepan with the sugar, salt and vanilla seeds. Warm over a medium heat until the sugar is dissolved, then remove from the heat and stir in the remaining cream and all the milk. Preheat the oven to 190 degrees C. Line a baking tray with greaseproof paper. Melt the butter in a small frying pan then stir in the pecans. Mix til completely coated then transfer to your baking tray. Sprinkle with sea salt and toast for about 10 minutes, turning every so often. Remove from the oven, set aside to cool then roughly chop. Warm the golden syrup over a gentle heat. Once slightly liquid, stir in the golden and maple syrups and breadcrumbs. Add the egg, cream and lemon zest and juice then transfer to the same tray you toasted your pecans on. Bake your treacle tart filling for around an hour at 190 degrees C, forking up at ten minute intervals to ensure plenty of slightly toasty edges. Once a lovely golden brown colour and slightly crisp to the touch, remove from the oven and leave to cool. Once cooled blend half the mixture in a magimix to fine breadcrumbs, and tear the other half into bite-sized chunks. Churn the vanilla base in your ice cream maker according to the manufacturer’s instructions. A couple of minutes before it’s done, pour in your treacle tart breadcrumbs. Sprinkle some chopped nuts into the container you plan to freeze your ice cream in. Pour over some ice cream, sprinkle with some of your treacle tart bite-sized chunks, then repeat the process in layers until you’ve used up all the ingredients. Give it a little stir if you think the pieces need to be incorporated better, then freeze. Remove from the freezer ten minutes before serving to allow to soften slightly. To crystallize your rosemary, brush sprigs in egg white, sprinkle with a little caster sugar and sea salt, and set aside in a warm place to dry out. Finely chop. Make the pastry using this simple recipe, adding the chopped crystallized rosemary along with the flour in the final stage of mixing. Roll your pastry out to a few mm thick. You can then either roll around ice cream cone moulds if you have them, press into mini mince pie tart tins or bake flat as biscuits. Bake at 190 degrees C, checking after 10 minutes as these little pastries do colour quickly. If making cones, you’ll notice that one edge becomes slightly flatter where they rest on the baking tray – try turning regularly to avoid this but be careful not to break the pastry – it’s very friable! Once cooked to your desired colour, remove from the oven and leave to cool before serving with big scoops of sticky, chewy ice cream. Bliss. I love treacle tart but even more than treacle tart, I love the idea of serving it as an ice cream with those little nuggets of pastry! A lovely combination. You are, utterly and truly, ice cream GODESS! I am just head over heels for this! What an absolutely amazing combination of flavors. I love love love your recipes for ice cream. They’re always so inventive and utterly mouth-watering. Really – love love love. I need an ice-cream maker – as in, desperately need one now – so that I can make this too. Will have to settle for the scrumptious sounding biscuits in the meantime. Oh my! This sounds heavenly! What a sinful combination. Kathryn – the little nuggets of filling are so good, they go all toffee-like and delicious after the ice cream has sat for a few hours. Skye – you HAVE to buy an ice cream maker, they are the best invention ever . . . Single Gourmet & Traveller – it’s unusual, but so delicious. 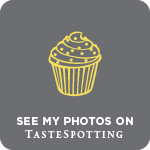 Nuts About Food – I have such fond memories of that year – and many more besides ice cream! Ah ice cream at 10 in the morning isn’t too early is it? I don’t think I’ll be able to find this particular combination anywhere though… so unfortunate! My mind is BLOWN. I am going to have to try this. Oh little loaf – this sounds MENTALLY good!! Im also an ice cream obsessive, although (much to my his chargin) despite dragging my husband around London every weekend for ice cream and fro yo (hello gelato mio and Snog! ), I have yet to make much use of ours. I think I need to change that. Your description brought back such happy memories of Thailand too! I was also obsessed with the sacharin sweet ice cream n sale there – love love loved it. Also – did you get into the condensed milk sweetened iced coffee? so bad and yet so GOOD! I think I need to dig out the ice cream maker and do this! I’ve never had treacle tart…it sounds quite similar to Canadian butter tarts. What an innovative combination of ingredients in the ice cream! It looks lovely! Wow. This is totally inspired. I think it’s high time I found me some treacle tart!! Wow! What a cool recipe. 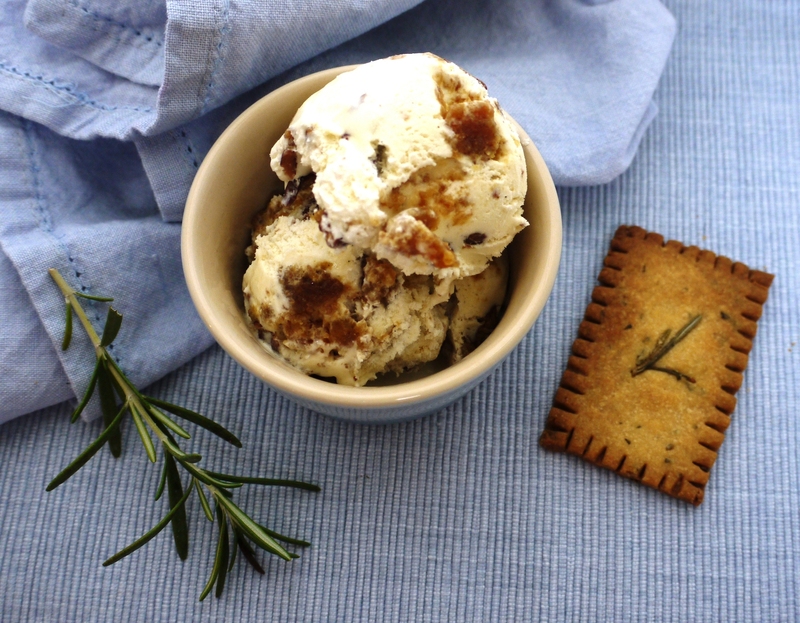 I love the idea of treacle tart ice-cream – yet more ice-cream inspiration! Wow! This is super fancy and looks super delicious! I wish I can just have someone make this for me, that would be even better! Frugal Feeding – the pastry is so good. It’s sweet and salty all at once and the extra kick of herb really gives it depth of flavour. Em – yes! Condensed milk iced coffee is heavenly – in fact, it would be a gorgeous ice cream flavour . . .
Cake Brain – you must try it. Treacle tart is probably one of my favourite puds. 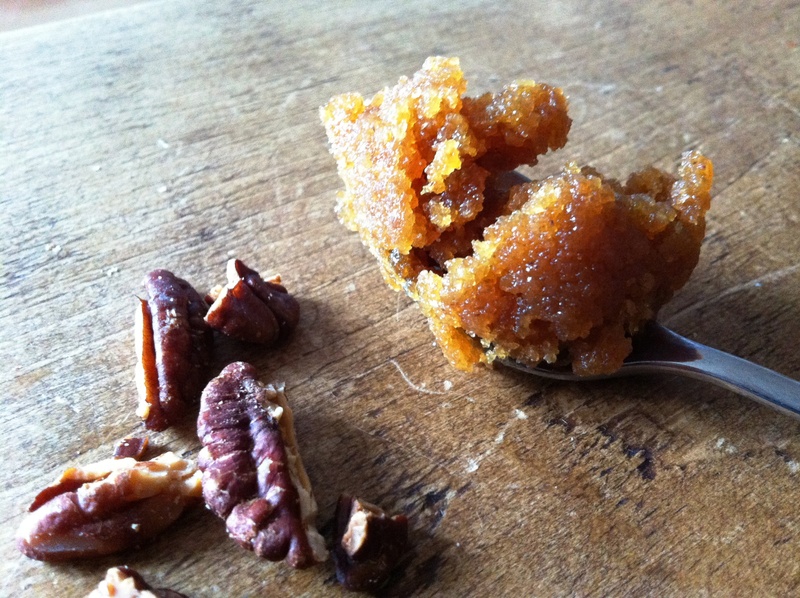 Lorraine – the saltiness really cuts through the sweet treacle filling – so good. Margarita – I think half the joy is in making it yourself – it’s so much fun! This is so inspirational and sounds utterly gorgeous. I don’t have an ice cream maker but each time you do a post on ice cream, I feel myself succumbing a little further to the temptation! Only lack of space prevents me from giving in! May try this one by hand though as it sounds so good. Wait! 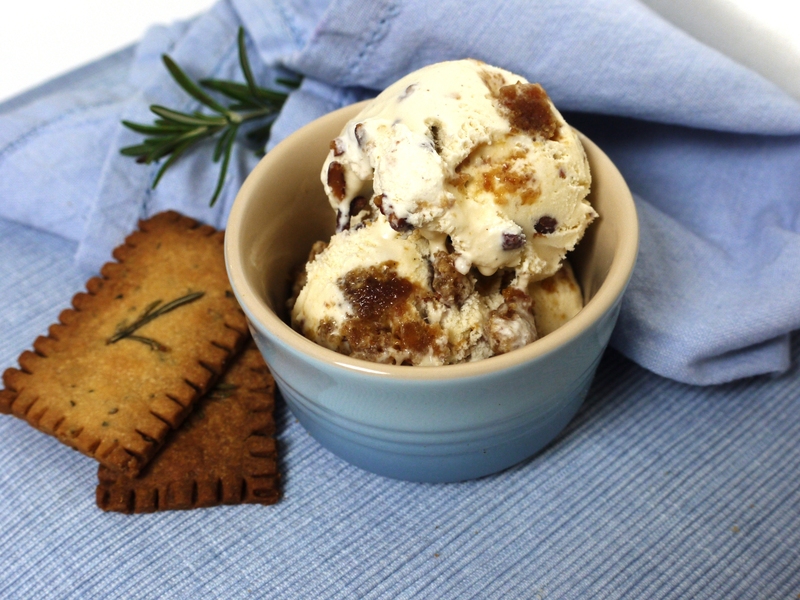 This it too beautiful and delicious…..You didn’t just make a wonderful ice cream, but also you made your own salted rosemary cones! Awesome. 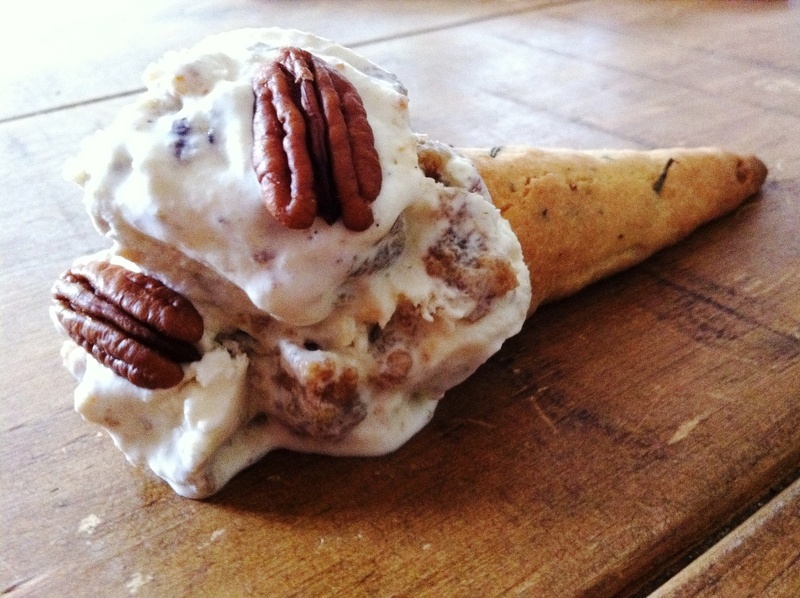 I have bookmarked so many of your ice creams already… sigh, but you never keep coming up with ones I want to try. 😉 I have never had treacle tart but from the posts I’ve read of yours about it, and from the description of this ice cream, it sounds perfect. Thanks for all the ice cream inspiration! Your recipe is great. Thanks for sharing! Your ice cream looks amazing!!!! 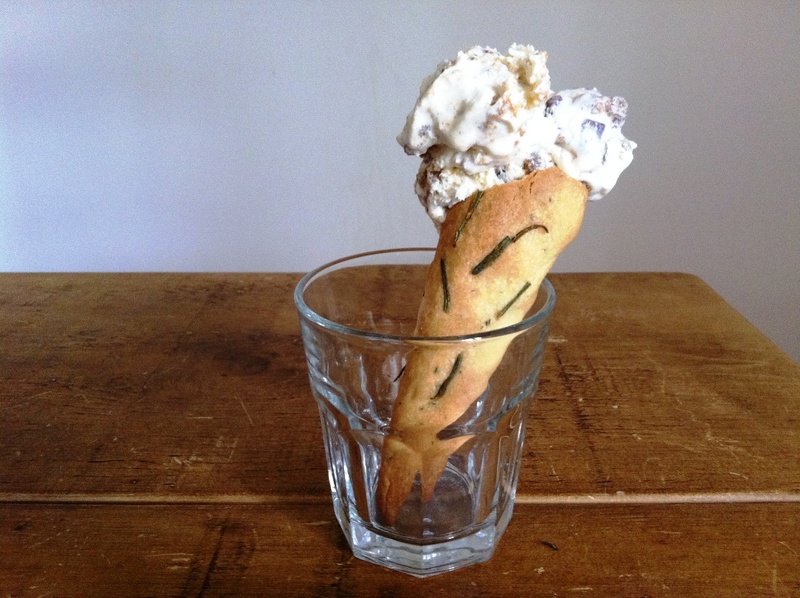 The flavours here sound amazing….as does that rosemary and sea salt pastry! I LOVE rosemary and sea salt together…such a wonderful combination. Absolutely not surprised that ice-cream is the food experience you remember most on your travels – you are an ice-cream maker extraordinaire. And this post is terrific. 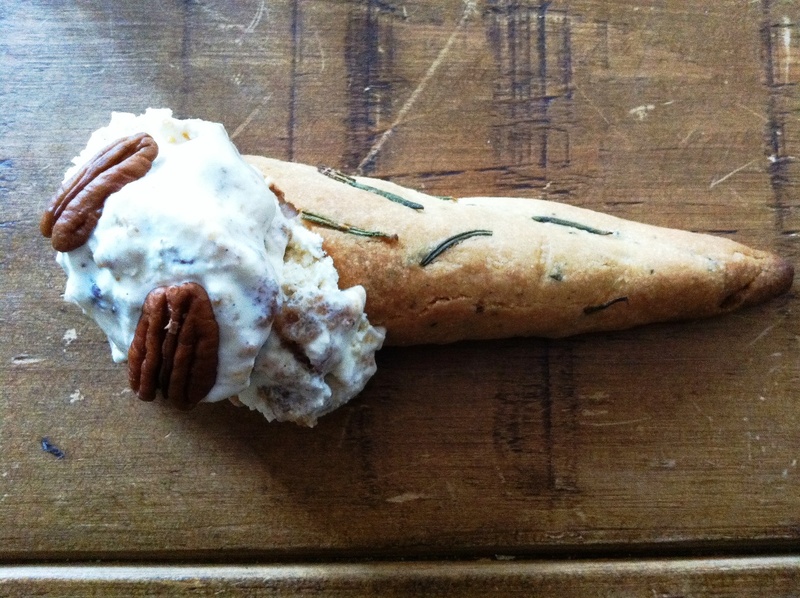 You are one of the most inventive bloggers I know and I have no words for that salted rosemary pastry just mmmmmm! And don’t let having a job put you off from travel experiences. CT and I handed in our notice, rented out my flat and took off to NZ and Oz for a year. We only had £1,000 each on top of our plane fairs, but we managed to have the most fantastic year with so many amazing experiences and wonderful people. Admittedly, it took a while to get a job when we got back, but we managed eventually and it was so worth it. This is a 5 -star dessert! I love the treacle tart – I can’t help thinking of how I salivated every time it was mentioned in the Harry Potter books lol Chopped into ice cream must be heaven, and that rosemary sea salt pastry looks and sounds wonderful! What a gorgeous ice cream! My mouth was literally watering as I looked at the photos. That’s truly a winner. Amy – I don’t keep mine in the kitchen, I store it in our spare room, so totally understand how you feel about space. It’s worth it though! Amy – you have have HAVE to try treacle tart, it’s heavenly. Karen – I don’t think I’ve ever had treacle pudding, but can imagine it’s divine stirred into ice cream. Jeanne – haha thank you!